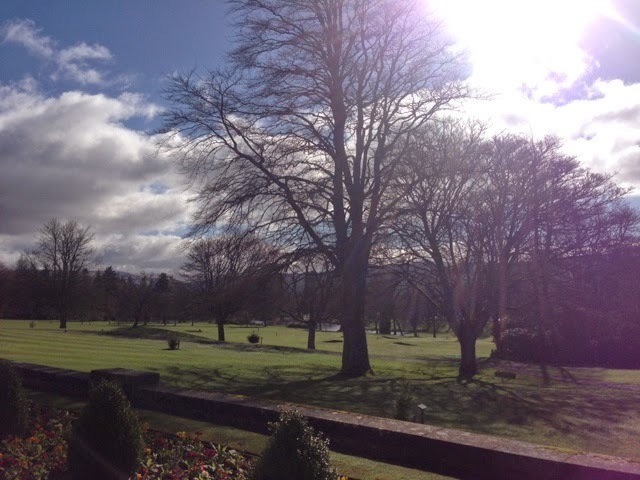 Last Tuesday I went along to Gleneagles for a spa day and it was utter bliss! 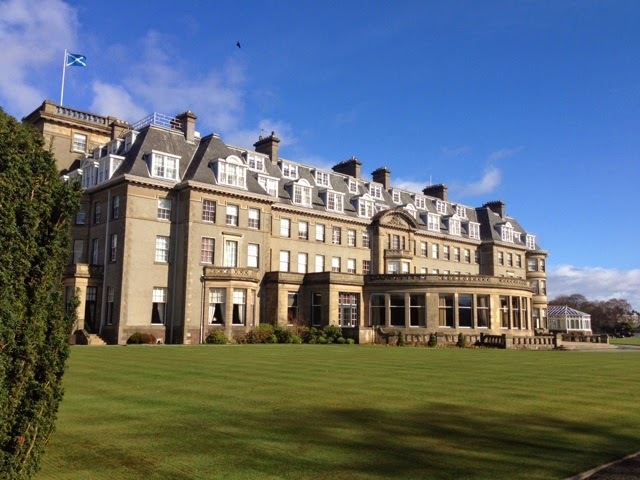 I've been lucky enough to go to Gleneagles a number of times, a few through times through work, and have both visited the spa before and stayed a few times. I'm not exaggerating when I say it absolutely love everything about this hotel and it's one of my favourite hotels in the world. However, it's an expensive visit, whether you are there for food, an overnight stay or a day spa visit but for me it's definitely a case of you get what you pay for. The hotel is set in large, beautiful grounds and has three adjoining golf courses, which I've played, and is hosting the Ryder Cup this September which tells you how good the golf is! There are lots of activities you can do here including gun dog training, horse riding etc. but I love just going for a walk around the grounds, especially when the sun is shining. The spa day package I chose cost a total of £155, so at the top end of the scale for a day of pampering but honestly the whole experience was perfection. I was lucky enough to have some vouchers which were bought for my birthday in January by one of my besties, Clare, and my mum and dad, so a big thanks to them for their generosity :) This price included two specially tailored pregnancy treatments, a 55 minute body treatment and a 55 minute facial, and a two course lunch. 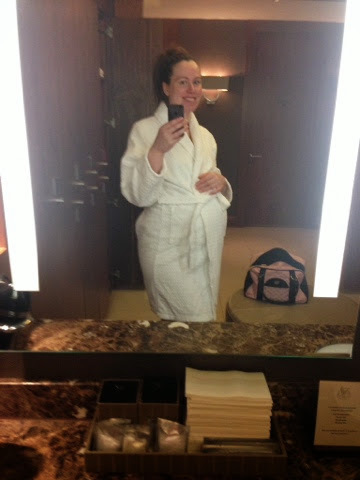 When you arrive at the spa, you are checked in and shown round by one of the lovely staff, you get a giant locker with your robe, slippers, towels etc. 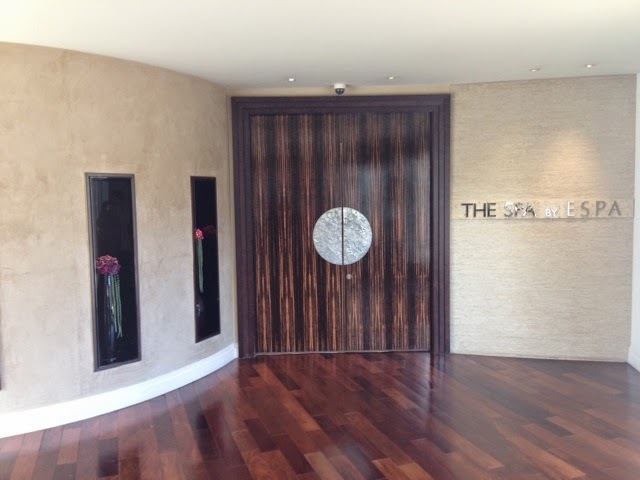 and the different areas of the spa are explained. There are saunas, steam rooms, tropical showers (where the water is scented!) and the loveliest relaxation room ever. It has adjustable beds with giant pillows and fluffy throws, with snacks and refreshments on tap. It's difficult not to doze off in there but then that's part of the chilled out experience. I stayed away from the steam room and sauna, but enjoyed floating in the hydro pool and enjoyed the feeling of almost lying on my stomach. Pfffft how I have missed lying on my tummy. 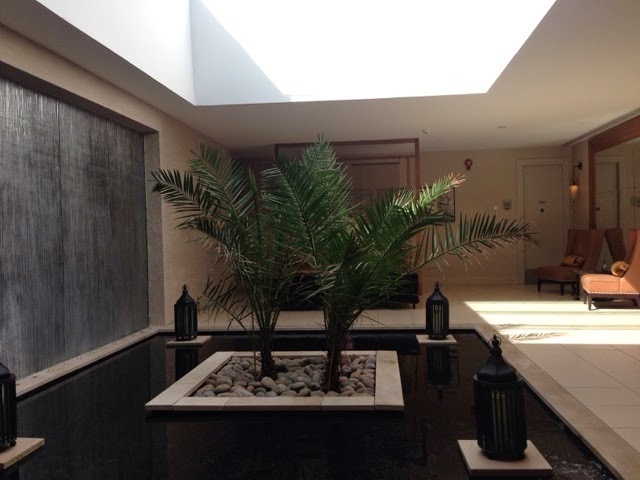 The pool in the spa is not big enough to actually swim laps in, you can go to the main pool to do this (which is just a short walk from the spa) and also has a large outdoor jacuzzi pool, but I was quite happy to stay chilled in the spa.My treatments were excellent. The perfect balance between relaxation and working out some knots in my tired pregnant lady body! The therapist started my treatments by chatting through any skin / body concerns I had to incorporate the correct oils / products in to my treatment. I still got to chose, by doing a few smell tests on the back of my hand, which ones I wanted to be used on me, which I like as the smell of the oils etc. play such a big part in the enjoyment of the treatment for me. It was a little bit strange getting a massage lying on my side and not my front, but my therapist did a great job and working out my back muscles. At the start of the facial, they analysed my skin with what looks like a black light (I'm sure it has some posh name, maybe a wood lamp??) but the therapist says it shows any areas of dryness or skin damage so that the facial can be tailored to what your skin needs. Mine showed a little bit of dryness (Baby Star has been causing a lot of dryness in my skin!) and a bit of sun damage around my eyes. The facial itself was perfect. My skin felt pampered through out and I enjoyed the hair and scalp massage whilst my skin mask was at work. 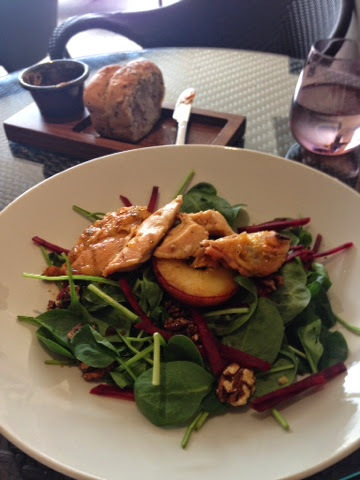 After my divine treatments it was time for lunch, which was honestly some of the best food I've eaten! 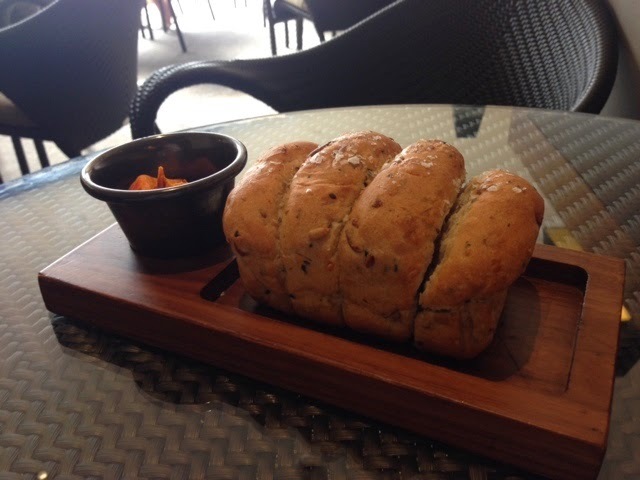 When I sat down I was brought some warm seeded bread with sun dried tomato butter (yum!!) whilst I waited on my drink to arrive. They bread was so good, I ate the lot. It was massive! Still super healthy and very, very tasty but I was genuinely shocked at how large a portion it was. 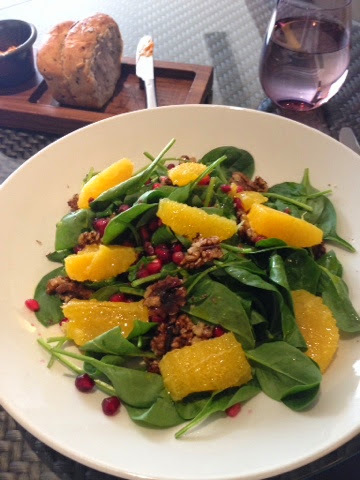 I couldn't quite finish it and left a bit of spinach, still happy in the knowledge that I'd got three or four of my five a day. You'll see there's quite a bit more spinach on my plate! This was on the menu as part of the dish but I had expected a side salad portion with the chicken, ha! The chicken, cooked in their tandoor oven, may be the best chicken I have ever eaten. The flavour was simply amazing. They way you wish chicken cooked on your own BBQ tasted. Really juicy and full of flavour and the roasted apple, with a hint of cinnamon, went perfectly with it. Mmmmmmm, honestly I could go back tomorrow for that chicken salad. All that's left for me to say is I can't wait to go back, who wants to come with me? ?